It is without question that murder is the lowest, most despicable and inhuman act. No matter what crimes a person may have committed, when the life of another is taken, the ultimate line is crossed. Of course there are so many different kinds of murder, from the indiscriminate actions of the serial killer all the way across the spectrum to murder as an act of self defence. But surely every such act must diminish the killer’s own humanity. Some murderous actions are rationalised and defended, sometimes from a political or religious standpoint. We condemn the terrorist who is killing for an ideal, but they are convinced that their actions are justified as their victim is the enemy of and a threat to their own people. Yet we also send our own soldiers to kill others in warfare, we don’t consider this to be murder although our enemies probably would. Capricorn Research does not wish to get into some kind of moral maze here, just to show that different kinds of the same crime of killing another human being can elicit very different responses. One area that can provoke a wide range of responses is where someone in a relationship murders their partner. On one level, this is perhaps the most difficult act to understand. How can a relationship that is essential one of love, so easily turn into the complete opposite resulting in an act of such hatred ? On the other hand the sheer intensity of the feelings that some people experience in relationship can be turned through intense jealousy or possessiveness into acts of extreme violence. Sometimes when someone kills their partner it is a premeditated act, in order to collect on the insurance or for some other financial gain or simply to free themselves from a relationship in order to pursue another one. But in most cases it would be an act of a moment when the feelings have just got completely out hand and a madness takes over. This kind of murder might be referred to as a crime of passion, although surely this term endows the act with a kind of undeserved nobility, as if to say these things sometimes happen when people feel so strongly about each other. The truth of course is that anyone who could actually kill their partner or even their ex, can never claim to have actually loved them in the first place. What they believed was love was probably nothing of the sort, it was an intensity of feeling and a loss of control that swung pendulum like to unthinkable extremes. What would we expect astrology to say about someone who murders their partner ? Its always difficult to make general observations about any group because every single act is unique and each killing would have its own particular symbolism, but are there certain themes that are more likely to come up. Capricorn Research has a collection of 100 charts of people who murdered a partner and whilst this is too small a sample to make definite conclusions, it might give us a few pointers. In terms of Sun signs, the highest scoring are Leos and Taureans with 13 followed by Aries with 12 and Aquarius with 11. It is interesting that there seems to be a Fixed sign emphasis, but Scorpio, the sign that we might most closely link with jealousy and possessiveness scores only 7. Virgo, however is the lowest scoring with only 2. This distribution carries a p figure of 0.085, so nowhere near the less than 0.01 figure that we would need to give it some significance. So Capricorn Research cannot say that Leos are 6.5 times more likely to kill their partner than Virgos. In fact if I did suggest that, its quite possible that a large number of otherwise innocent Leos would be tempted to murder me. Other interesting indications are the Moon top scoring in Aries with 15 while it only occurs in Taurus 3 times. This might give credence to the notion of an act committed in the heat of the moment by someone experiencing powerful emotions. On the other hand Venus is in emotionally cool Aquarius 18 times whereas its in Aries 4, Leo 4 and Sagittarius only 3 times. This is the only distribution that looks significant with a p figure 0.014. Mars is a planet that we would expect to feature prominently and it is in Gemini 16 times and in Pisces only 3. We might expect the 7th house of relationships to be prominent with perhaps some difficult planets placed there, but in this sample it isn’t. In terms of aspects there are some trends that are interesting. The Moon makes considerably more oppositions than conjunctions in these 100 charts, with the highest scoring being the Moon opposite Mars which occurs 216 % of the expected number of times. The square between these two also occurs relatively frequently at 157 %. Hard aspects between Mercury and Pluto are prominent as well with the opposition at 180 % and the square at 195 %. Mars’ square aspects occur more frequently than expected with the Mars / Uranus square top scoring at 240 %. This is an interesting one particularly when we consider the explosiveness and unpredictability of that aspect. Intriguingly the combination is reinforced by the highest scoring aspect in the sample, Uranus square the Ascendant scores a whopping 310 %. So we have a Mars / Uranus connection that seems to have some significance, together with a Moon / Mars one which is backed up by the Moon’s high score in Aries. Capricorn Research would like to see whether these themes continue to recur in much larger samples, but that could be said for all of the work presented in these articles. The one question that always comes up with astrology research is how far its appropriate to look for shared patterns amongst groups of people that have something in common. Astrology is the study of the uniqueness of a particular moment and how that applies to an individual born at that moment. Even if we take charts of people who are involved in so called crimes of passion, is it fair to assume that they will have similar characters ? So we need to study each individual chart to give us insights into why that particular person committed such an act. A case could be made for people who kill their partners being quite different from other murderers. It might even be fair to ask whether that person would ever have considered killing someone else, outside the dynamic of the relationship. If they were married to someone else, would they also have killed them. Or would they have murdered anyone with whom there was no close personal connection. We can never know the answers to these questions for sure but astrology gives us an opportunity to look at the charts of both murderer and victim so we can perhaps gain some insight. Maybe its something about the synastry of the couple involved that draws out the violent tendencies that might have otherwise lain dormant. This kind of thing can take us into difficult areas because it introduces the idea of a possibility of a victim mentality together with questions about the victim being partly responsibility for what happened. This is not the intention at all, the responsibility lies totally with the perpetrator, but looking at both charts can be revealing. One classic example of this is of an American couple who remain anonymous. The husband was extremely jealous and possessive, he kept his wife a virtual prisoner. When she fled to her mother’s home, he followed and shot her five times in the chest and head, and then shot himself. Even someone with a very superficial knowledge of astrology would point out that they are both Scorpios, the one sign that is renowned for intensity in relationships, together with issues around possessiveness and jealousy. Their Suns are also in conjunction with each other, a fact that always adds to a strength of karmic connection for good or bad. The husband has the Sun in Scorpio, Moon in Libra and Cancer rising, not on the face of it the kind of character that we would all be assuming was a murderer. The wife has the Sun and Ascendant in Scorpio with the Moon in Aquarius, not the kind of combination for an easy ride through life. If we look closer however we can see that she was likely to be in for a very rough time indeed. Her Sun is conjunct Mars in Scorpio, and in opposition to Saturn in the 7th house of relationships. It would be simple to see this as someone who would be on the receiving end of a violent marriage. 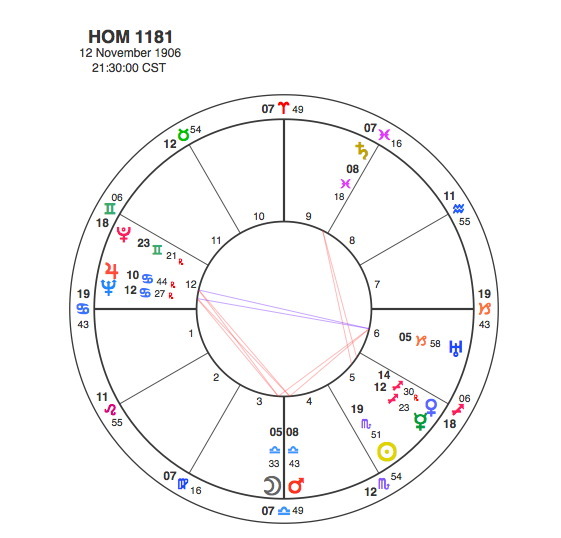 Whats more, Venus the natural significator of marriage is opposite the violent Pluto, a planet that is already considerably strengthened by being her Sun / Mars / Ascendant sign ruler. Her Sun and Mars is also square to the Moon, another indication of stress and even violence in relationships. The synastry with her husband is very strong. His Sun is conjunct her Mars and very closely square to her Moon showing that he ( Sun ) would be the instigator of this violence. The husband has a T Square based on an opposition between a Jupiter / Neptune conjunction and Uranus which focuses onto an apex Moon / Mars conjunction in Libra. From many other studies of T Squares in these articles we know that it is an aspect of considerable tension which forces the person to act in a way strongly defined by the apex planet(s). Such an afflicted Moon / Mars conjunction points to an act of emotional violence and in Libra within the setting of a marriage. So both partners have intense Moon / Mars issues that connect strongly with each other. Interestingly both Moons are at the bottom of the chart in the 4th house of home and family. Technically the husband’s Moon is at the very end of the 3rd but its conjunction with Mars takes its influence into the 4th. Given this symbolism, its seems somehow tragically appropriate that he murdered her because she had escaped to her mother’s house ( 4th ). In the husband’s chart, the opposition that fuels the T Square has Jupiter and Neptune in Cancer in the 12th house. Cancer is a sign that is emotionally possessive and likes to keep family members within a closely defined area, it finds it difficult to give people their freedom. The 12th house is the house of withdrawal, retreat and even imprisonment. So Jupiter / Neptune here shows how he would want to keep her a virtual prisoner. This conjunction is opposite Uranus, a planet that rules both freedom and sudden actions. 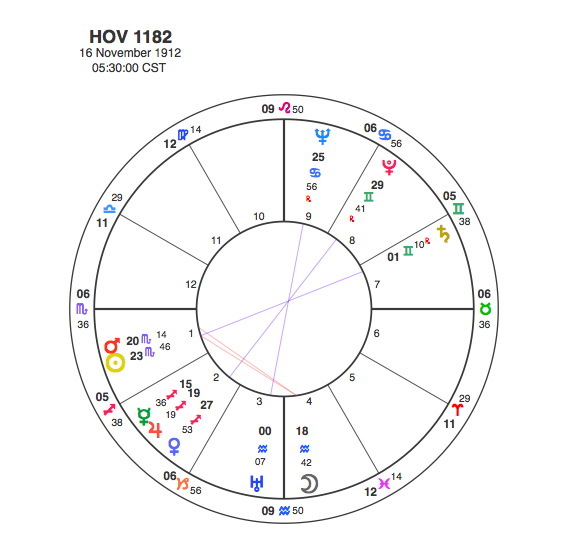 So when the wife made a break and ran to her mother’s house, the tension created in the husband’s chart forced him to act in a way commensurate with the apex of the T square. The Moon conjunct Mars in Libra in the 4th house symbolised the murder. So when did this happen ? In September 1947. When an act is so clearly indicated in someone’s chart by a T Square, it is likely to happen when the relationship between the planets in that aspect pattern is repeated. The slowest moving planets by transit are always the most powerful, so we are talking about Neptune. Neptune would make only one contact with the husband’s T square during his lifetime, moving through it between 1945 and 49. In September 1947, Neptune was exactly conjunct his Mars. For the wife, Saturn was opposite her Moon and applying square to her Mars. The husband has both the Moon / Mars and Mars / Uranus connections that come up in the research sample. So we could say that he has some things in common with the kind of profile we might expect of a wife murderer. But the synastry between them also shows that it was their particular relationship that caused these things to be triggered. So was it a typical crime of passion ? It just seems wrong to use that word – it was a crime of jealousy and madness bordering on insanity. But looking at the astrology of it all, Homicide 1181 does look rather typical. I have to disagree with you where you said anyone who kills someone they say they love didn’t love them. What about if you are so in love and that person keeps dosrespecting you and thus it fills you with so much rage because thie person shows you so much disrespect after all you did for them and they are just plain disrespectful and shits on you??? This iw coming from a Capricorn, and I can teuly say my feelings run deep AF. Thank you for your comments. This is obviously a powerful thing for you. I would say that if this is the case, the feeling that you have for this person is very deep and intense, but it is not love.